To access the following settings, click in the menu and select Main. The name that is used to refer to the organization in areas such as the profile menu, on the Organizations screen in the mobile app, and in emails. The keyword that appears in your URL. This organization's keyword is "finashoes". The URL to access your Admin Application is https://keyword.mlearn.io/Admin/ and the URL to access your Learner Application is https://keyword.mlearn.io. IMPORTANT: When you change your keyword, the URL to access your account will change. Users who have saved the link or use the OttoLearn app may no longer be able to access their training. Turn on feedback in your account. Note: If this setting is turned off, learners will not be able to provide feedback at any level (Mastery Profile, Module, Topic, Concept, or Activity). The email address(es) of the people who should receive learner feedback. These people don't need to have an account in OttoLearn. The attribute that will be used as each user's display name (in the profile menu, in emails, etc.). The timezone for the account. This timezone will be assigned to all new users by default. ProTip: You can set a different timezone for each user, from the User Attributes screen. Turn notifications on or off for everyone in the account. 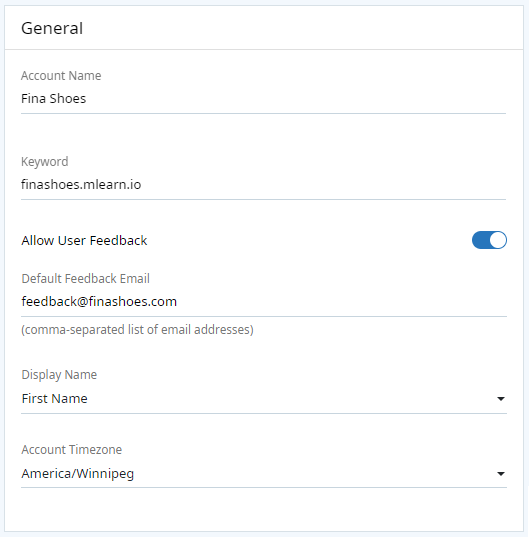 We recommend leaving notifications turned off in your account (default) until you have your engagement schedule(s) set up and are ready to launch your content to learners. Contact information for the organization's main contact for anything OttoLearn-related. By default, this will display the information entered by the person who created the account, but can be edited.